An association between coffee consumption and cancer has long been investigated. Coffee consumption among Norwegian women is high, thus this is a favorable population in which to study the impact of coffee on cancer incidence. Information on coffee consumption was collected from 91,767 women at baseline in the Norwegian Women and Cancer Study. These information were applied until follow-up information on coffee consumption, collected 6–8 years after baseline, became available. Multiple imputation was performed as a method for dealing with missing data. Multivariable Cox regression models were used to calculate hazard ratios (HR) for breast, colorectal, lung, and ovarian cancer, as well as cancer at any site. We observed a 17 % reduced risk of colorectal cancer (HR = 0.83, 95 % CI 0.70–0.98, p trend across categories of consumption = 0.10) and a 9 % reduced risk of cancer at any site (HR = 0.91, 95 % CI 0.86–0.97, p trend = 0.03) in women who drank more than 3 and up to 7 cups/day, compared to women who drank ≤1 cup/day. A significantly increased risk of lung cancer was observed with a heavy coffee consumption (>7 vs. ≤1 cup/day HR = 2.01, 95 % CI 1.47–2.75, p trend < 0.001). This was most likely caused by residual confounding due to smoking, as no statistically significant association was observed in never smokers (>5 vs. ≤1 cup/day HR = 1.42, 95 % CI 0.44–4.57, p trend = 0.30). No significant association was found between coffee consumption and the risk of breast or ovarian cancer. 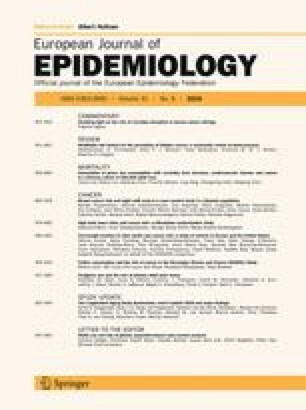 In this study, coffee consumption was associated with a modest reduced risk of cancer at any site. Residual confounding due to smoking may have contributed to the positive association between high coffee consumption and the risk of lung cancer. The online version of this article (doi: 10.1007/s10654-016-0142-x) contains supplementary material, which is available to authorized users. ML carried out the statistical analysis and drafted the manuscript. IL contributed with the interpretation of the data and revision of the manuscript. EL was responsible for critical revision of the manuscript. EL is also the PI of the NOWAC. GS and EW critically revised the manuscript. TB developed the research plan, prepared the data, revised the manuscript, and provided critical help for the multiple imputation modeling.